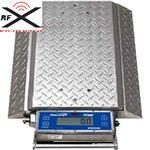 PT300™ scales feature Fully Integrated RFX™ Wireless Weighing Technology and are designed to maximize legal payloads with concern for violations and reduction of maintenance due to overload stress on equipment. The PT300™ is a sturdy, all aluminum, fully electronic, self-contained wheel load scale that is capable of weighing loads up to 25,000lbs (12,500kg) with an accuracy of ±1%. 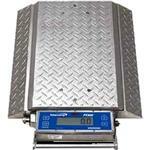 PT300 ™ Scales are sturdy, portable and compact. Lightweight and accurate, this all-aluminum design is ideal for uneven surfaces and withstands most weather conditions. The PT300 ™ is designed to maximize legal payloads with concerns for violations and reduction of maintenance due to overload stress on equipment.